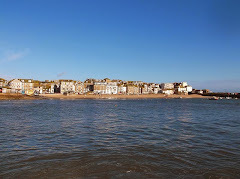 As the Easter Holidays get underway lots on in St Ives. Here is a selection of highlights. Craft Supplies Show - Everything For The Creative Crafter. 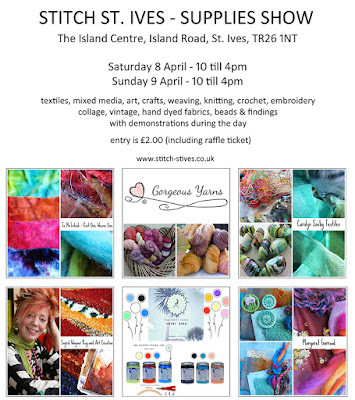 Stallholders from around Cornwall and the UK with lots of lovely goodies. Fabrics, yarns, wool, beads, buttons ... lots more. Food and drink available - by Cafe Art and Sweet Beach Bakes. Saturday 8th and Sunday 9th April - 10.00 am to 4.00 pm. Great atmosphere, real ales and free entry. Friday 7th April - 9.00 pm - Sinpusher. Saturday 8th April - 9.00 pm - Salt Water Cure. Sunday 9th April - 3.00 pm - Rooster. Fundraiser for St Ives Jumbo Association. Saturday 8th April - 8.00 pm. Little Red Riding Hood and Under The Sea. Friday 7th April at 3.00 pm. Also - on Tuesday 11th, Thursday 13th and Friday 14th. Work in various media by club members. Open daily until Friday 21st April - 10.00 am to 5.00 pm. There is a new project to establish an Education Hub at St Ives Library. More news on that in a blog post next week. 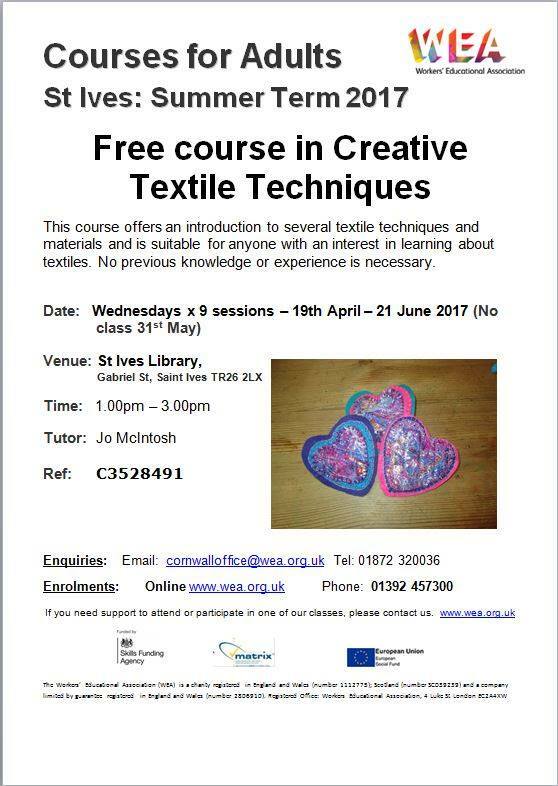 But - just announced - Creative Textiles with Jo McIntosh. 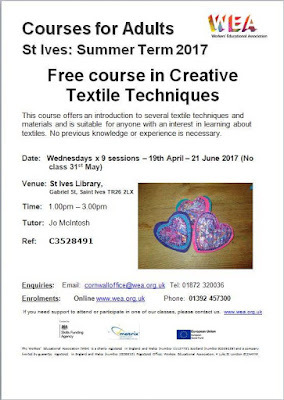 A nine week course starting on Wednesday 19th April. Places are FREE - but you must book!